Ice water is generally the drink of choice in our family. However, sometimes we like to get a little crazy and gussy up our drink glasses. Those glasses always feel fancy when they sport this pretty red beverage. Ordinary iced tea just doesn't cut it with our picky glasses though. Oh no. They only feel spiffy when showing off iced tea like this, which gets a bit of tartness and beautiful color from the hibiscus leaves, and sweetness from the combination of honey, sugar, and freshly squeezed orange juice. Bring the 8 cups of water to a boil. Take off heat and add the hibiscus leaves, tea bags, and orange peel. Cover and let sit for 10 minutes. 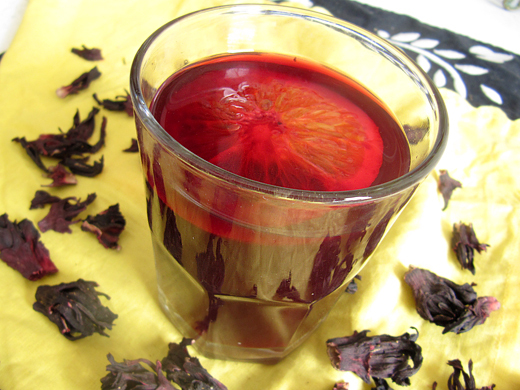 Strain out the hibiscus leaves, tea bags and orange peel. Stir in honey, sugar, and fresh orange juice. Chill and serve with orange slices. Looks refreshing and the weather here in Flordia calls for something like this. Hope you are having a wonderful day. We would LOVE this. Pinning! I need to get my hands on hibiscus, Starbucks is getting too expensive and too far to drive for this! Thanks for sharing this refreshing drink-yum! I drank a lot of cold hibiscus tea in Mexico. Thanks for the recipe! That really is such a gorgeous color for a drink! what an inventive glass of iced tea. looks refreshing! Looks so refreshing! I love the color! Looks so refreshing! Love the color! What a delicious way to glam up iced tea...lovely!!! This iced tea looks very pretty to serve for parties. Love this idea. This is such a fun flavor for iced tea! I can't say I've ever really had anything hibiscus-flavored before but anything that pretty-in-pink/red has to be delicious. What a clever iced tea flavor. I love the addition of orange peel - that must be a delightful accompaniment. Recipes like this make me so anxious for a hot summer day..! I use ready to use hibiscus tea powder, but this sounds fun recipe! What an exotic recipe - looks divine and so refreshing! Hibiscus is our National flower and I should serve this drink on our National day this year. Looks so pretty and refreshing. This tea would be so refreshing with the warm weather we are having now! Beautiful photos on your site! thats such a good idea...i would definitely love to try hibiscus in macarons!